Verses 1-10 give us a repeat of the loaves and fishes story from chapter 6, but with a few details altered. 7 loaves instead of 5, and 4000 people instead of 5000, etc. Did this scenario really occur twice, or is it just a duplication, with 2 different oral traditions of the story? I’d go for the latter. Next we have the Pharisees demanding that Jesus show them a miracle to prove himself. Early skeptics! But Jesus acts insulted and refuses, then leaves in a huff. This passage is significant because apologists use it to admonish present-day doubters who ask too many questions. You’re not supposed to ask, just have faith. But I like the skeptics. But the disciples take his remark literally and start arguing about not having enough bread, and he gets exasperated and asks them ‘don’t you get it? and why would you worry about bread anyway, don’t you remember how we fed all those people?’ OK, now the story makes more sense, but it seems to me that the message of this chapter so far is “don’t listen to outsiders, don’t question anything, just take it all on faith”. 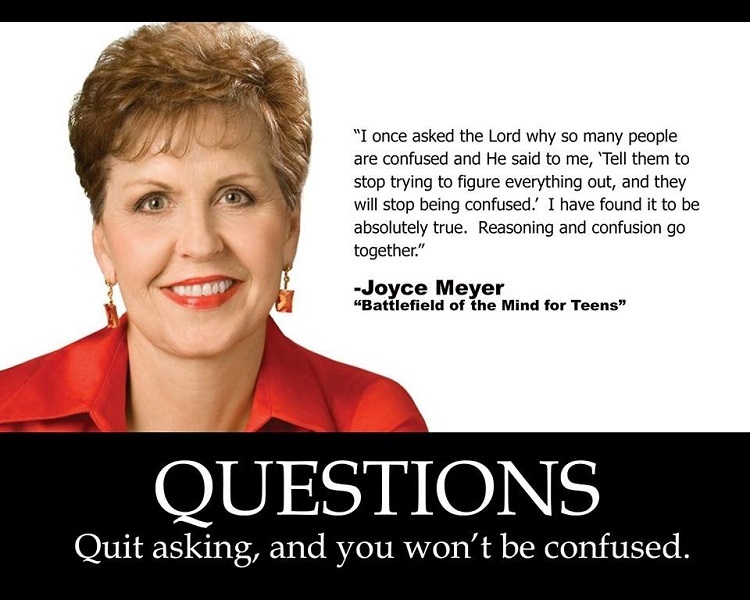 Now I know where Joyce Meyers gets her advice from; I take mine from The Thinking Atheist. Concluding the chapter, we have Jesus restoring a blind man’s sight by spitting on his eyes, another conversation about Jesus’ identity (is he John the Baptist, Elijah, or some other Messiah), and then the first mention of Jesus’ coming death and resurrection. We get the famous line ‘get thee behind me, Satan’ (v 33), but it’s addressed to Peter, not the devil (I never knew that). And then another famous line ‘take up his cross and follow me’ (v 34) followed by some chatter about returning in glory with his father and some angels. I don’t get the comment about the cross. There has been no previous mention of any cross, and Jesus’ remark in v 31 about dying did not specify a method of death, so there is just no context for the word cross. The apologist interpretation suggests that the disciples would recognize that a cross represented death and know that to follow Jesus would mean persecution and sacrifice. But I think that’s a bit of a stretch, and even if it were plausible, wouldn’t most of them just run? This begins with a very important (failed) prophesy from Jesus: “I tell you the truth, some standing here right now will not die before they see the Kingdom of God arrive in great power!” Apologists interpret this metaphorically; interesting how that works. 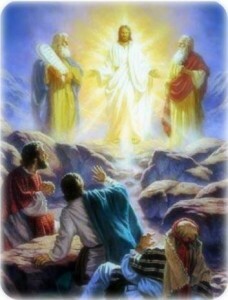 Then we move along to the first description of the Transfiguration. For thirty years I attended church every week, without knowing what that was. Moses and Elijah show up, and then disappear again. Interesting little story, but unless you’re already a believer, it only sounds like a figment of something the author was smoking. V 11-13 contain some interesting contradictions and interpretations. The coming of Elijah before the Messiah is clearly prophesied in Malachi 4:5-6. So the disciples wonder, “If Jesus is the Messiah, then where is Elijah?” Good question, but as always, apologists find a way around it – though Jesus does not say it, the prophecy of Elijah’s arrival refers to Jesus’ second coming, not his first, and Elijah will likely return as one of the two witnesses as Revelation 11:2-13. (I kid you not.) But what about the assertions that Elijah has already come (as John the Baptist). 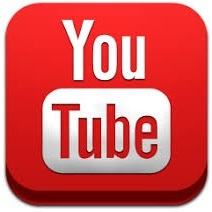 (Remember, this will be denied in John 1:21). Apologist answer – John was not a reincarnation of Elijah, but he did minister in the role and spirit of Elijah. John the Baptist was a type or a picture of Elijah. Bahaha! Obviously, according to apologist reasoning, anything in the bible that seems reasonably plausible is literally true. If it’s contradictory or demonstrably false, it’s metaphor. In the next story, Jesus supposedly heals a boy possessed by a demon; but the boy’s symptoms are classic of epileptic seizures. When Jesus is asked to help “if you can”, he responds with “Anything is possible if a person believes” (v 23). That statement has caused untold harm to children ever since, as their parents turn away real cures in favor of prayer. And after Jesus heals the boy, he remarks that that kind of demon possession can only be healed by prayer and fasting. Except that ‘fasting’ was apparently not part of the original manuscript; according to Bart Ehrmann, in Misquoting Jesus, it was added later by scribes who wanted to promote asceticism. V 33 – 46 give us many of the ‘feel-good’ quotes and one-liners that Jesus is famous for: The first shall be last and the last shall be first; Whoever welcomes a little child…; Anyone who is not against us is for us; a millstone around one’s neck; If thine eye offend thee, pluck it out. And in v 47 we get our first glimpse of the Christian concept of hell – “where the maggots never die and the fire never goes out” (or in the more poetic KJV, “Where their worm dieth not“).